TPS5200/2SS 2S Li-Po Race-Line 5200 mAh, 1 pc. 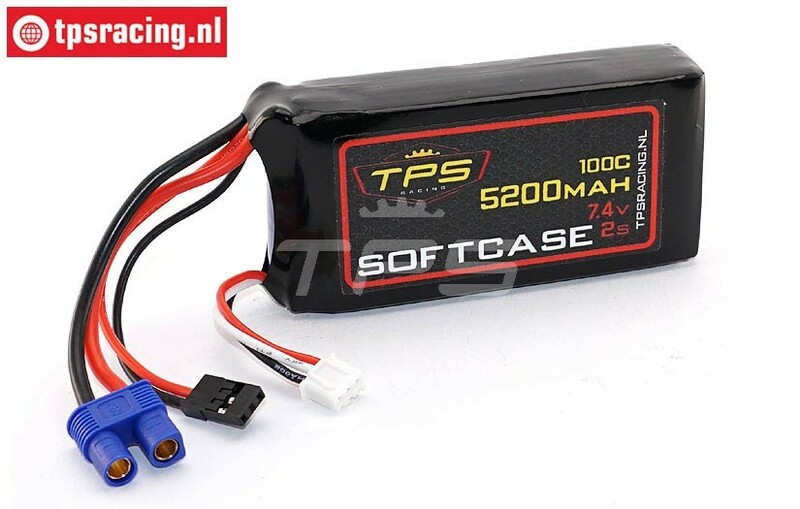 Very low weight of only 200 grams so very suitable as a receiver battery. Battery of a very high quality, constant capacity and internal protection against overcharging and deep discharging. 100C means that the battery can supply 520 Amps continuously! Cables are high-quality, fine-core silicone with a very low internal resistance. Charging and connecting can be done via the EC3 plug, additionally equipped with a JR-Uni plug for direct connection to the receiver. This battery can of course only be charged with a Li-Po suitable charger with a maximum of 5 Amps, ie a maximum charging time of 1 hour! Ideally suited for models with big steering and gas-brake servo's. A perfect upgrade for various models in terms of driving time. We are proud to say that this is one of the best batteries you can buy! Simple 5 Ampere charger without any fuss.